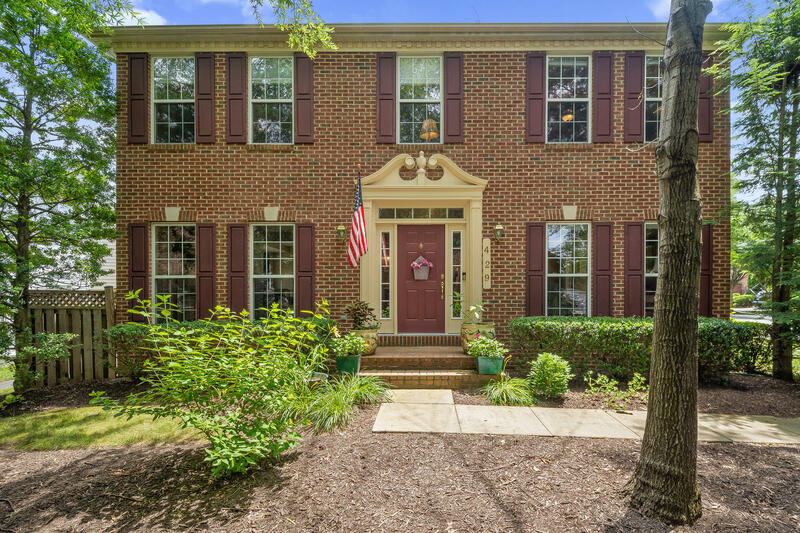 Located just off a tree-lined walking path in the most pleasing garden setting, sits this wonderful 4 Bedroom, 3.5 Bath brick front & side, single family home. Polished hardwood floors span throughout the main level to include the living room, the dining room which is accented with crown & chair rail moldings & a brightening bay-window bump-out, and into the family room complete with a cozy gas fireplace. The hardwood floors continue into the recently renovated & remodeled kitchen showcasing recessed lighting and beautiful quartz countertops paired with attractive 42-inch cabinetry with glass paned accents, soft-close drawers, built-in pantry, and decorative shelving. Sleek stainless-steel appliances complete the kitchen and offer a 5-burner gas cooking stove, built-in microwave, dishwasher and French door refrigerator with bottom pull-out freezer drawer. The breakfast room off of the kitchen is highlighted with a trio of windows and an Atrium door that leads to the charming paver patio lined with a dainty garden and is fully fenced with rear gate access. Upstairs, you will find the master bedroom suite featuring hardwood flooring, dual walk-in closets, and a master bath with updated lighting, a dual-sink vanity, garden tub & stall shower. Three additional bedrooms and a full bath in the hallway complete this level of the home. The finished lower level of the home offers a recreation area, a full bath, a large laundry room with tons of shelving & storage options, and an extra room for storage or expansion. Completing this home is the attached 1-car rear garage with side load street access and driveway parking. In addition, this home offers favorable proximity to the Quince Orchard Park community amenities available to the residents including walking paths, the community clubhouse & exercise room, outdoor swimming pools, and multiple sport courts. Sitting just on the other side of the street from the Kentlands, you can also enjoy close proximity to shops, restaurants, grocery stores, and access to commuter transportation.